I can’t believe it’s still “a thing,” spontaneously buying red-eared slider turtles. Back in the day, in the 1950’s and ‘60 into the early 70’s, these turtles were commonly kept as pets. Typically, though, they suffered from poor care. Their habitats were plastic containers with a plastic tropical looking palm and a small place to swim. Water would become soiled quickly, and that likely precipitated the occurrences of salmonella. The turtles didn’t get sick from salmonella but they did get sick from unsuitable living in conditions, not to mention inadequate diets. 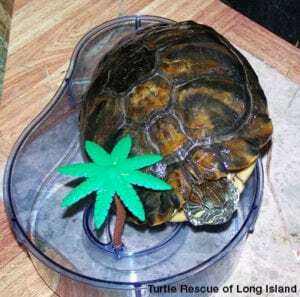 In 1975, the U.S. government banned sales of these turtle because of salmonella which even killed some people and made others sick, not having anything to do with turtle care. In defense, dating to the 1950’s, little was known about the care of red-eared sliders, but today much more is understood and there are veterinarians who specialize at treating reptiles. With proper care and nutrition, red-eared slides will grow to be about a food long (males a tad less) and can easily live over 20 years. As Federal restrictions on red-eared slider sales have eased, they are again being sold at places like street markets and fairs – and naturally at pet stores. However, there are reports of pets stores even keeping them in overcrowded conditions. Parents don’t always know about the salmonella threat – easily eliminated with thorough soap and water hand washing. But without adult supervision, washing hands is not something all children do well. And like all pets, an impulsive purchase is NEVER a good idea. But these turtles sell cheaply and so do often inadequate habitats. Red-eared sliders are omnivores and will eat about anything, and a variety is healthy for them, supplemented with commercial turtle pellets. Everything from little pieces of chicken or shrimp, a bit of egg, mealworms, tuna or salmon in small quantities along with green or red/green lettuces and berries or cut up apple, cantelope and other fruits. Change it up. Space is important as the turtles grow. Primary accessories to properly house a red-eared slider are a water filtration system, a water heater, a basking dock and a basking lamp. Because red-eared sliders are messy feeders and produce a lot of waste, so preferred may be a water filter that is rated at least double the amount of water in your turtle’s enclosure. This reduces the frequency of water changes that will be necessary. To ensure proper health and growth of red-eared sliders, a basking light that provides UVB and UVA rays, to mimic the sun, is important. Purchase either a commercial turtle basking dock or create your own basking platform onto which your turtle can emerge from the water to soak up the artificial sunlight and dry off. Temperatures in the basking area should range from 85 to 90 degrees. *NEVER make an impulsive turtle (or any reptile) purchase. *Research proper care. 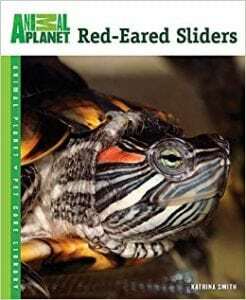 Books include “Animal Planet: Red-Eared Sliders,”by Katrina Smith; “The Complete IDIOT’s Guide to Turtles & Tortoises,” by Liz Palika, and “Turtles and Tortoises for Dummies,” by Liz Palika. *Purchasing an appropriate environment will cost more than the turtle – but it’s a necessity. *Insure proper veterinary care throughout the turtle’s lifespan.